This is a very complex defend game in which you will be the commander of all the remaining troops. The hordes attack was unsuspected and by the time the king found out it was too late for him or the army. One last squadron has escaped and now it is up to you to carry on the battle for your kingdom. The Baroness must lead the troops in combat but you are the one in charge of all the important decisions. Place your troops near the road the horde will have to pass and do not let anyone walk past you. 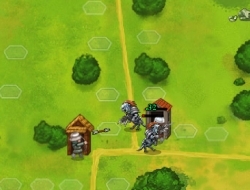 Place your archers further away from the roads because they have enough range. Constantly add more troops and upgrade your posts to survive. Demonrift TD 10.00 between 0 and 10 based on 1 votes.